Lock in a great price for Ringhotel Klövensteen - rated 8 by recent guests. We found the staff to be helpful and friendly - especially as we don't speak German. Restaurant food was filling and tasty. B/fast buffet was OK. They provided GF bread as well as we had requested this. All good. Rooms are nice but be aware of roof when go to bed; breakfast is as it has to. Private parking good heating in room. Bathroom is ok but shower height could be lower. Everything just fine. Not the most ambitious and stylish place , but sometimes there is no need to compete on the level of today's 4/5 Star boutique hotels. Very pleasant and friendly hotel. Good food. Highly recommended! As always this is a fine place to stay. I've got a customer nearby so it's an easy and ideal solution for me. 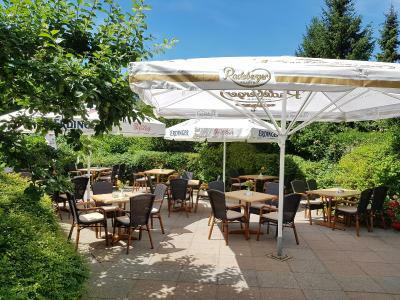 Their staff is friendly, their bar and restaurant are absolutely correct, the breakfast buffet offers a royal choice and the rooms are clean and comfy. Private parking space is limited but you can safely park outside in the street.. So, been there done that but.. I'll be back! Very good restaurant with good food and selection of wines. Very friendly staff in the restaurant. Das Frühstück war sehr variiert, frisch, nett aufgedeckt. Sehr zuvorkommendes nettes Personal. Frühstück war nicht nur besonders lecker sondern auch ein Augenschmaus😀 Zimmer war geräumig,super sauber ,hell und die Betten sehr bequem. Wir waren von der Zuvorkommenheit des Personals und der vorbildlichen Sauberkeit sehr angenehm überrascht! Es ist in diesem Haus eine sehr gepflegte Wohlfühl-Atmosphäre. Wir haben uns rundherum sehr wohl gefühlt. Sehr gut war unser Abendessen im Hotelrestaurant. Das Bett war unbequem - sehr breite "Besucherritze". Kein Schuhanzieher im ganzen Haus. Das Frühstücksangebot war recht mager. Wenig Wurst, vieles verpackt. Nichts Frisches, Regionales. Roomservice hat sehr lange gedauert. Ringhotel Klövensteen This is the official star rating given to the property by an independent third party - the Hotelstars Union. The property is compared to the industry standard and scored based on price, facilities and services offered. Use the star rating to help choose your stay! Bikes can be rented for the day to explore Schenefeld and the Schnaakenmoor Nature Reserve (3.1 miles). Visitors will find Hamburg Exhibition Centre is a 20-minute drive from Ringhotel Klövensteen. Hamburg Central Train Station is 10.6 miles from the hotel. Secure, underground parking is also available on site. 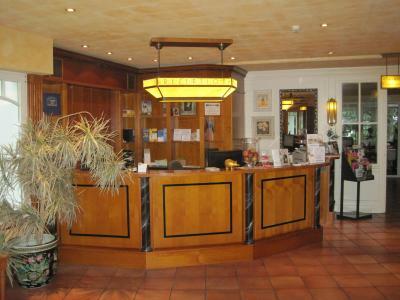 Ringhotel Klövensteen has been welcoming Booking.com guests since 31 May 2012. When would you like to stay at Ringhotel Klövensteen? Classically decorated room features a cable TV and a private bathroom with a hairdryer. Located in the front of the building. Classically decorated room features a cable TV and a private bathroom with a hairdryer. This room is quietly located in the building and offers a larger bed and extra space. This room is quietly located in the building and offers extra space. House rules Ringhotel Klövensteen takes special requests - add in the next step! Up to two children under 6 years are charged EUR 25 per night when using existing beds. Ringhotel Klövensteen accepts these cards and reserves the right to temporarily hold an amount prior to arrival. Guests arriving on 24 December can check in until 12:00. If you expect to arrive later, please contact Ringhotel Klövensteen in advance. Great breakfast , beautiful room.clean and good location. In the hot weather the double room they allocated us was boiling hot when we arrived. No AC. It was also prepared for one person not 2 in terms of bed linen and towels but they sorted it out quickly enough. Location suited us. Generally all good. With no air conditioning, the room occasionally was a little warm, but the staff brought us a very nice fan. Staff were very friendly, knowledgeable and efficient. Breakfast choices were varied, fresh and tasty. Rather unhappy reception, no smile or friendly welcome. Beds were very soft. Not a good location for visiting Hamburg city.